At Dark Side we have focused our lives on harnessing that magical chemical CH3NO2 "Nitromethane." 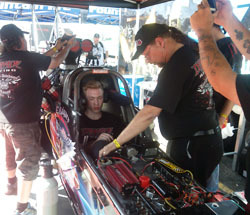 It comes as no surprise that we focus our courses on the "Top" category of Drag Racing. 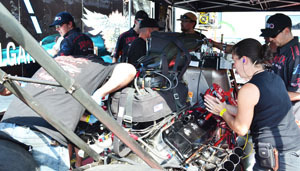 Drag Racing 101 offers students a basic understanding of racing, safety, mechanics and a history of drag racing. Then we transition to NITRO. *Custom classes can be developed and can focus on any part of our course outline. This is a phenomenal motivational tool that can be used to reward your sales force or excite your clients, and foster loyalty and goodwill. - Types of Racing - Bracket, Sportsman, Pro, ------ and "NITRO"
Advanced tuning, Technical and Computer Systems: Generally focused on a specific area -- Clutch, Fuel, Superchargers etc.